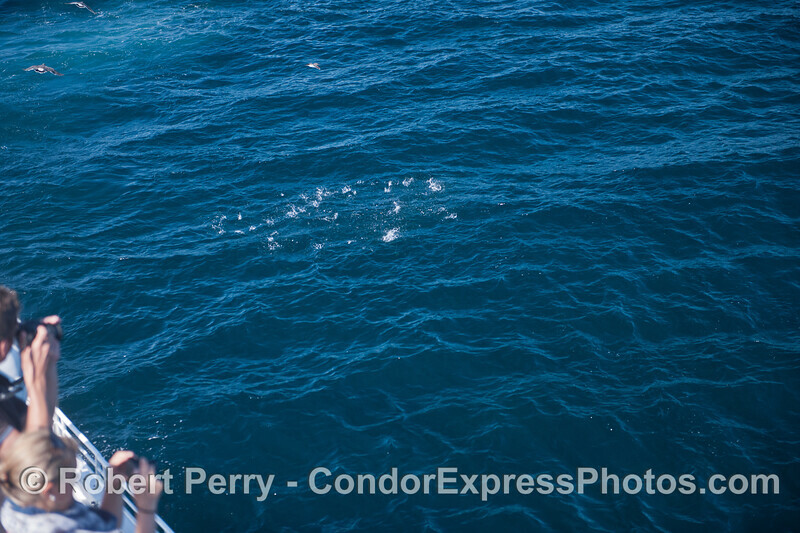 Blue sky, blue water. 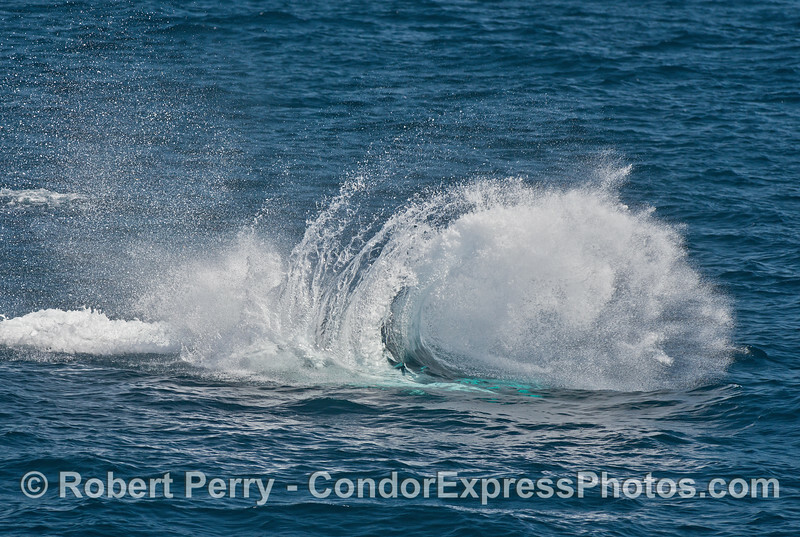 A light breeze and light chop. 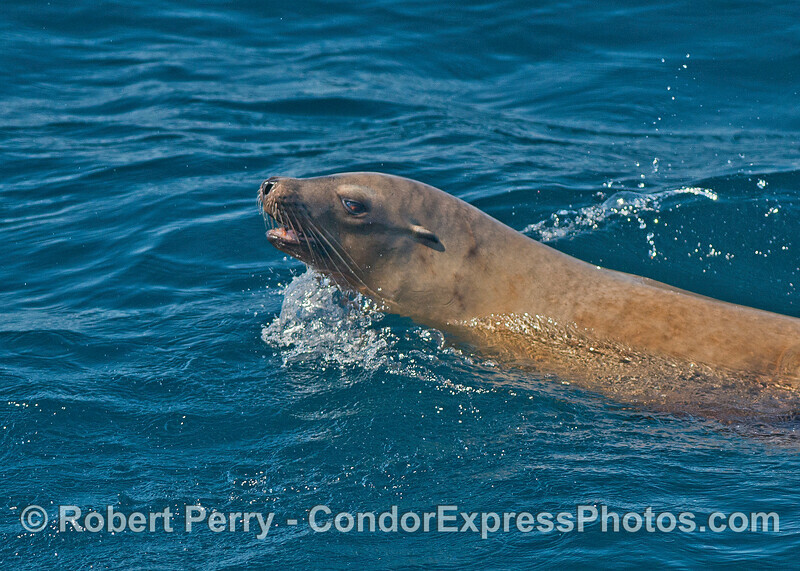 Warm and sunny. 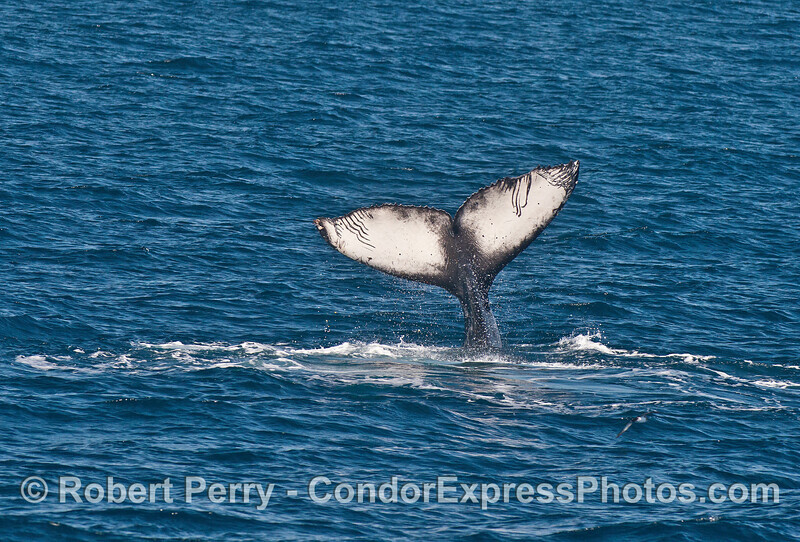 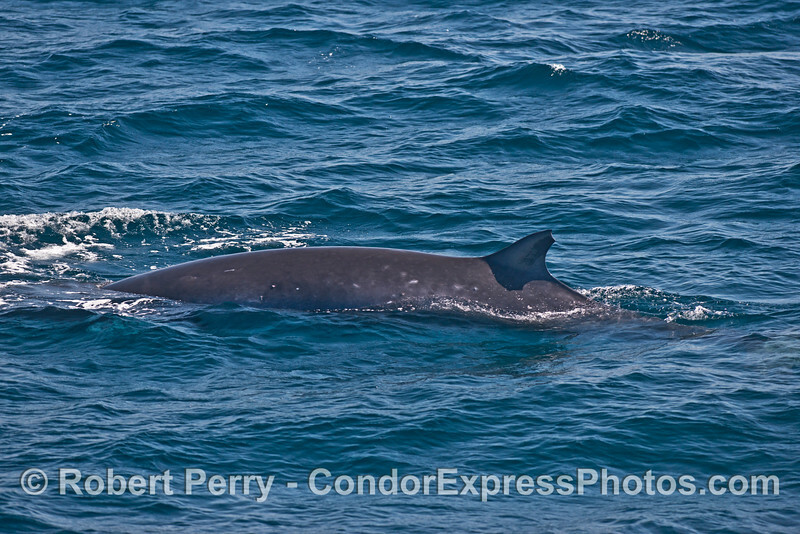 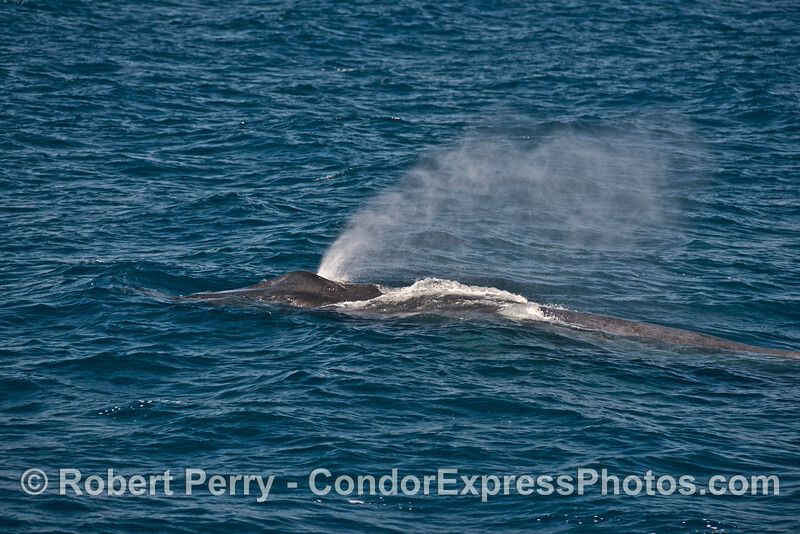 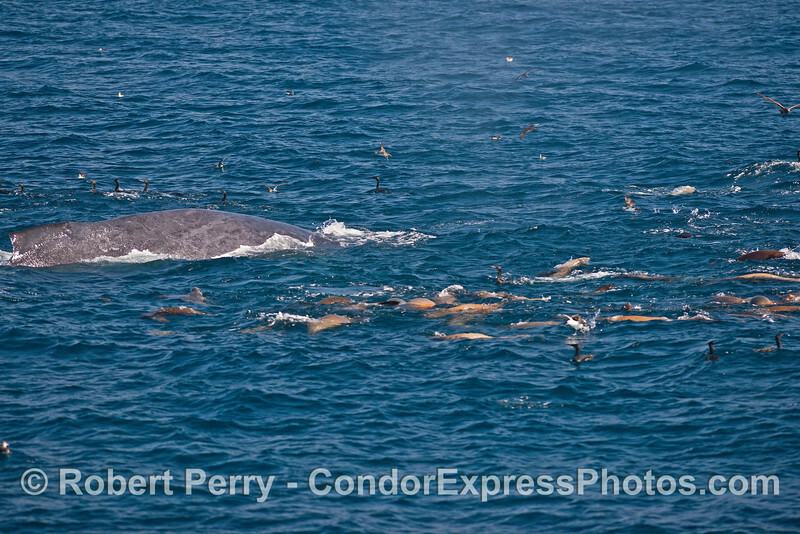 As we approached our first whale encounter in the northeastern Santa Barbara Channel, I knew we were getting close by the smell. 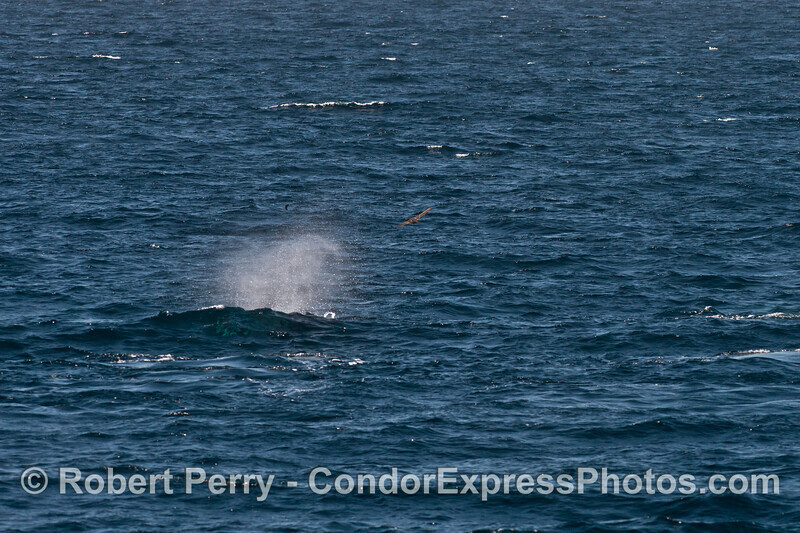 Lingering on the breeze was the characteristic “Essence d’Humpback” (not sold in stores). 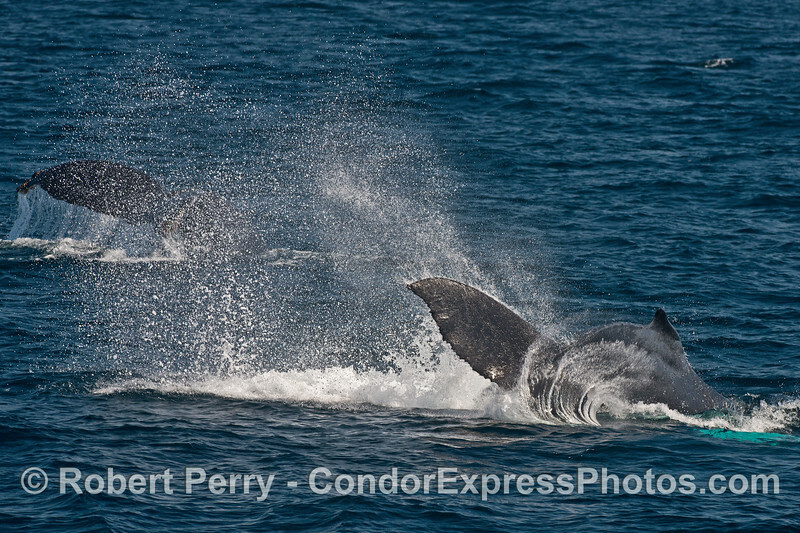 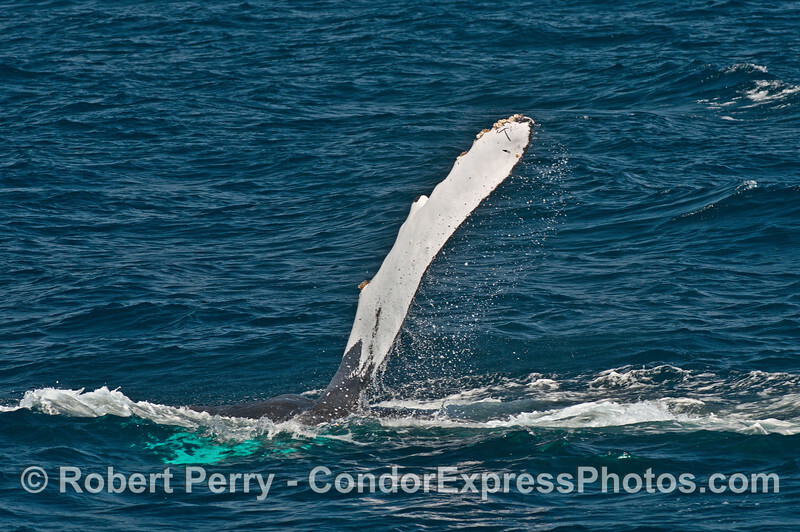 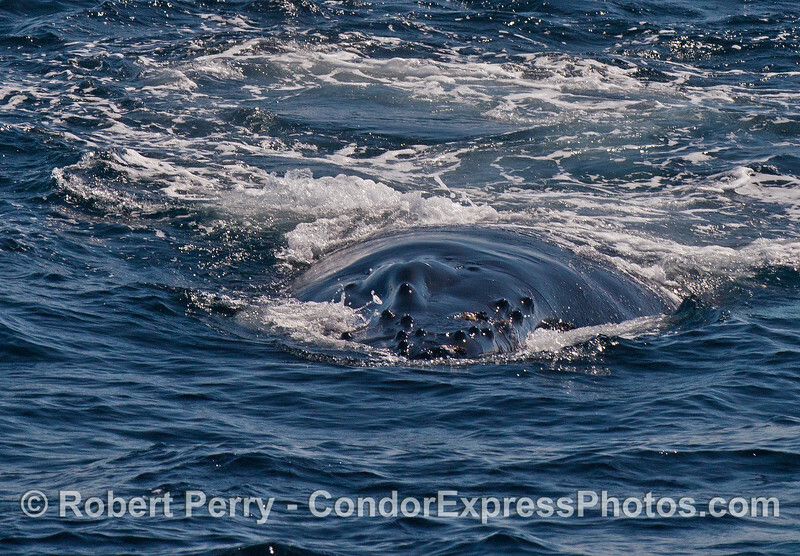 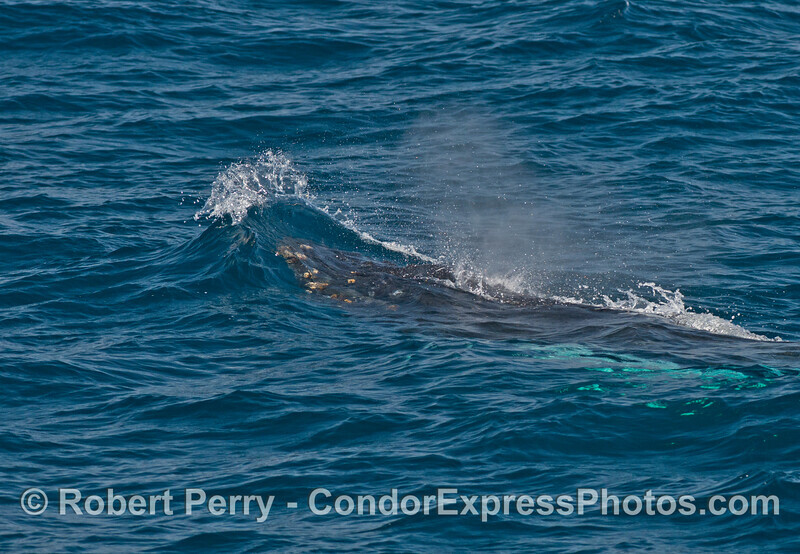 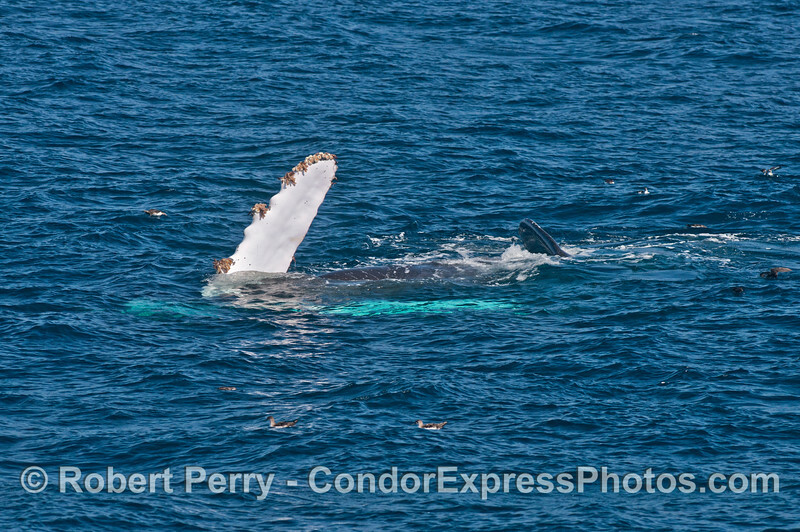 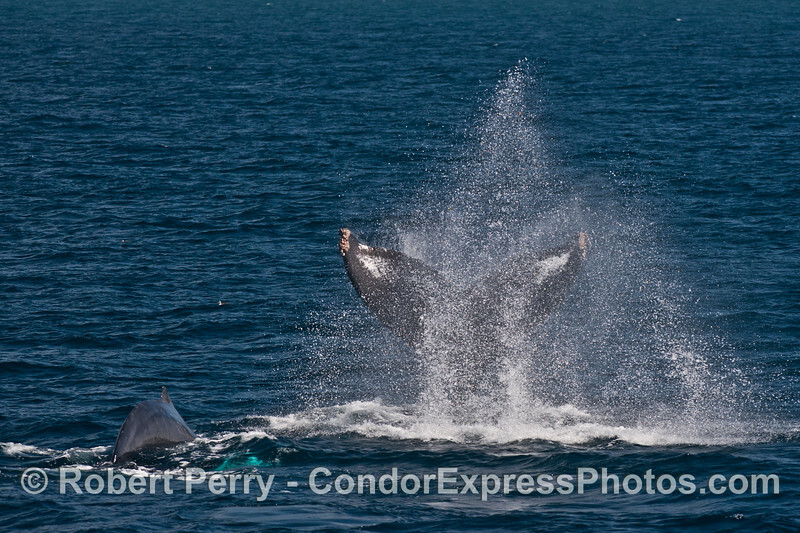 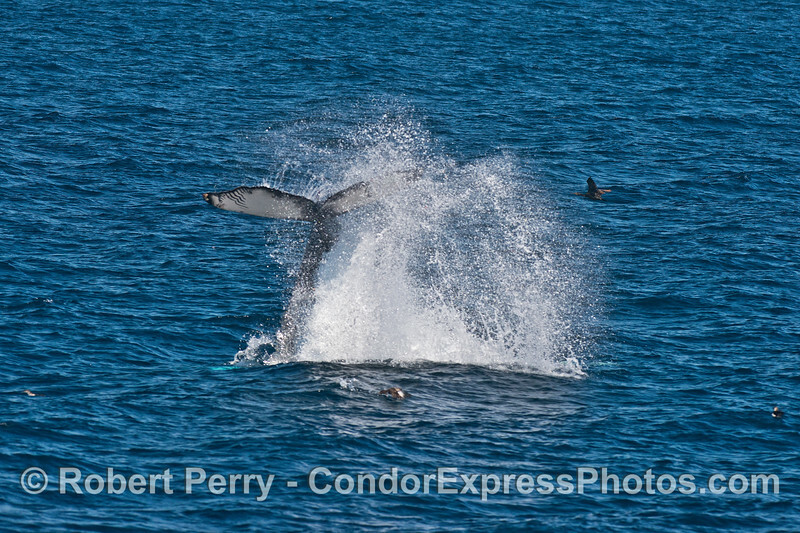 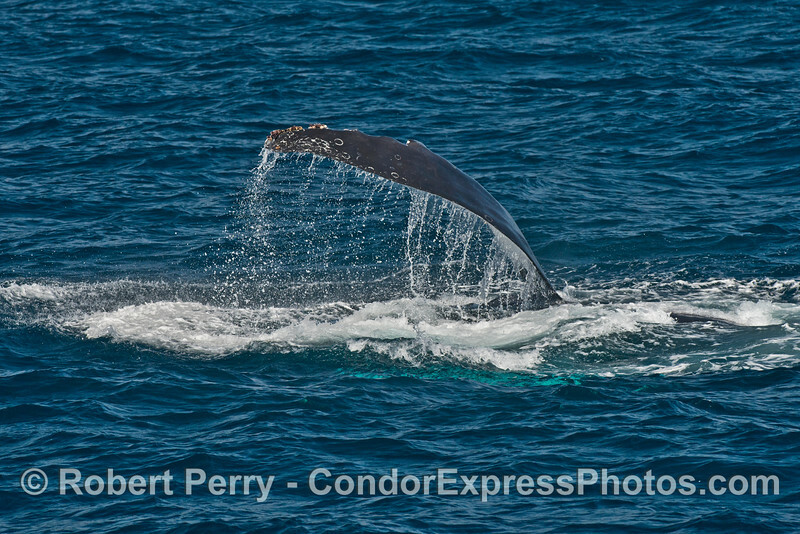 Sure enough it was that large female humpback and her white-on-both-sides calf…the same calf I called the “Energizer Bunny” last week when it breached for an hour and a half non stop. 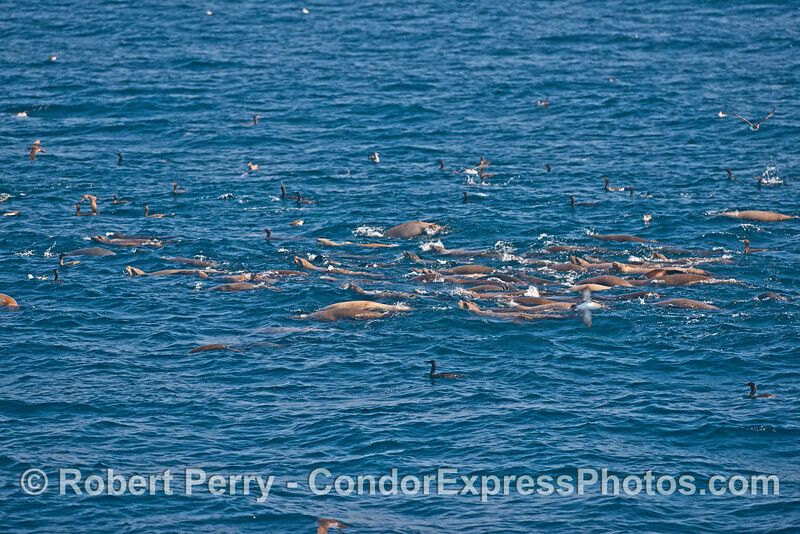 And if anything can annoy a juvenile humpback whale and fire up its batteries, it’s a large pack of pesky California sea lions. 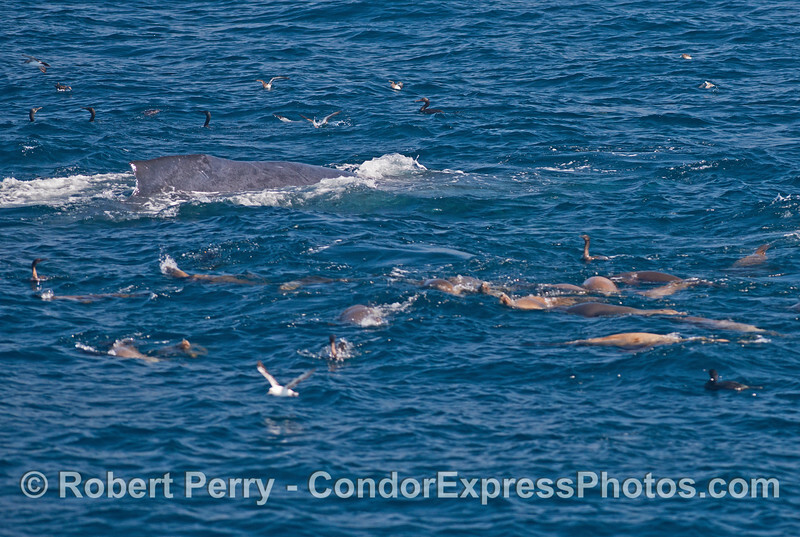 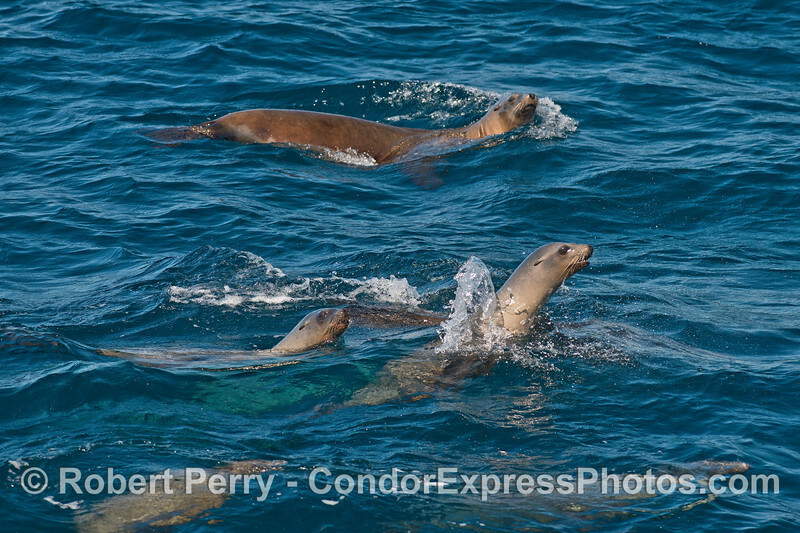 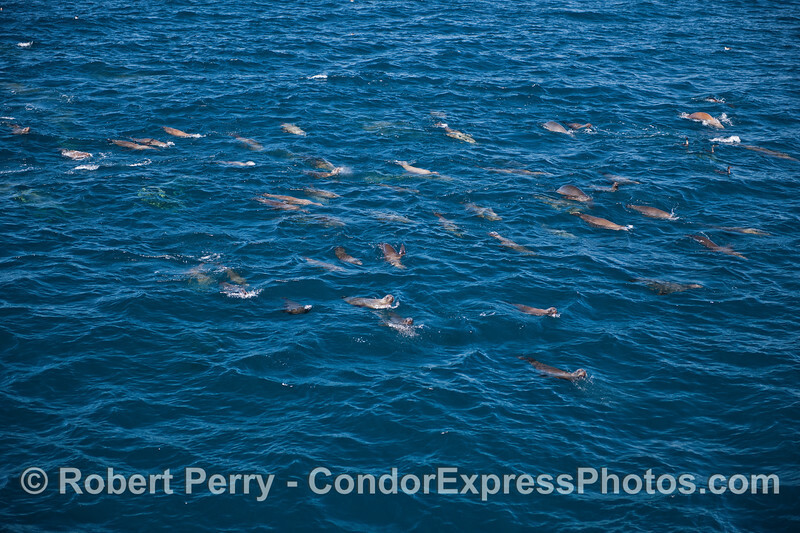 There was a gang of sea lions with over 50+ animals strong that were following the humpbacks, diving down together and surfacing together. 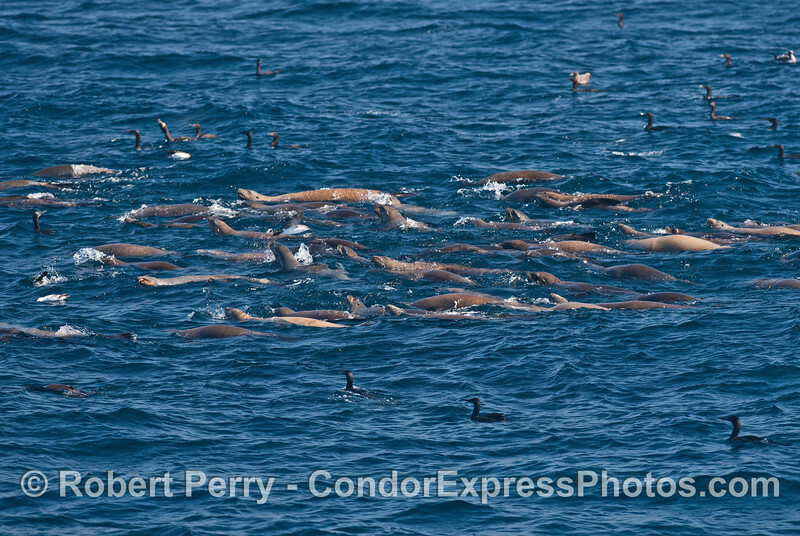 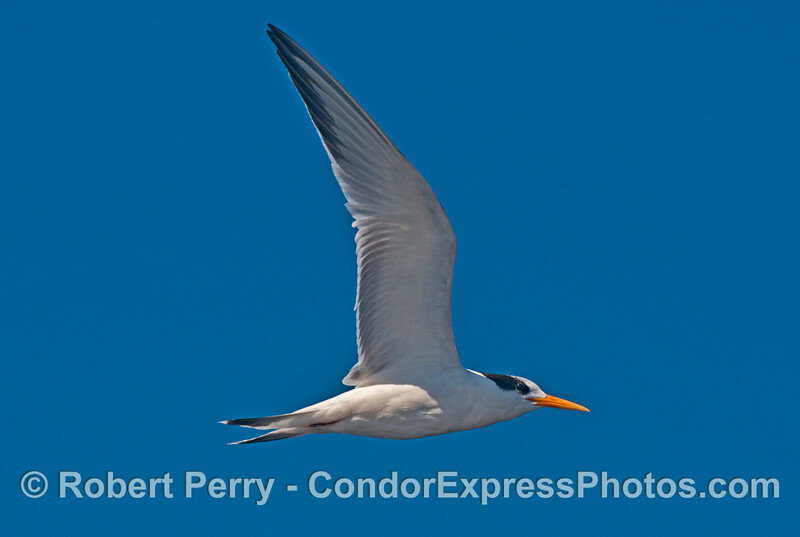 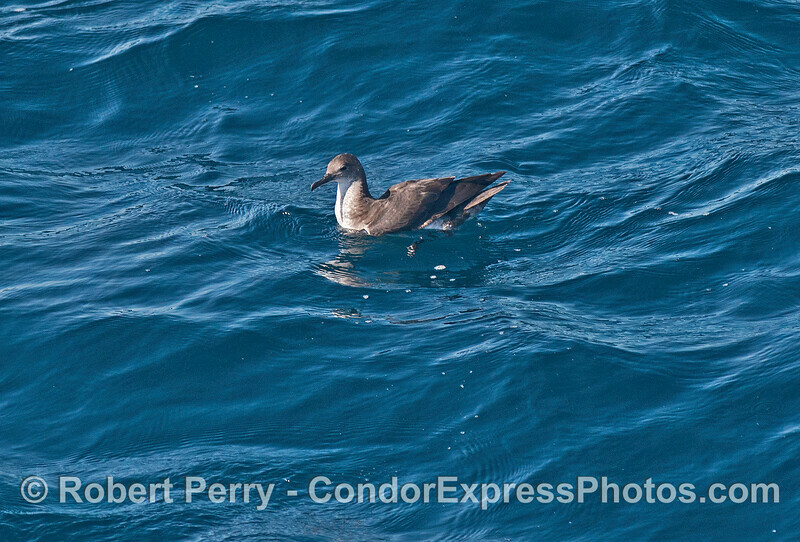 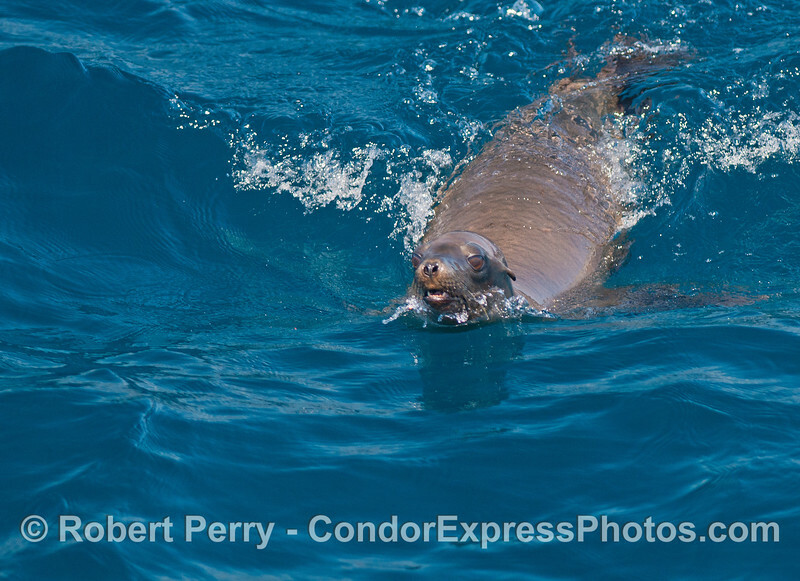 The furry brown pinnipeds were no doubt feeding on the same abundant northern anchovy schools as the cetaceans. 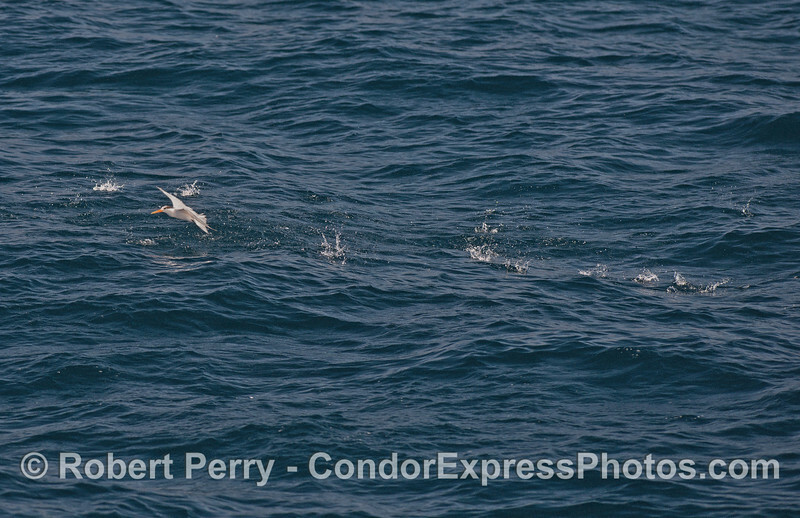 So as if on queue, the Energizer Bunny gave its fan club on the Condor Express quite a show with at least 22+ tail throws and lob tails which we all assumed was to fend off the sea lion troop. 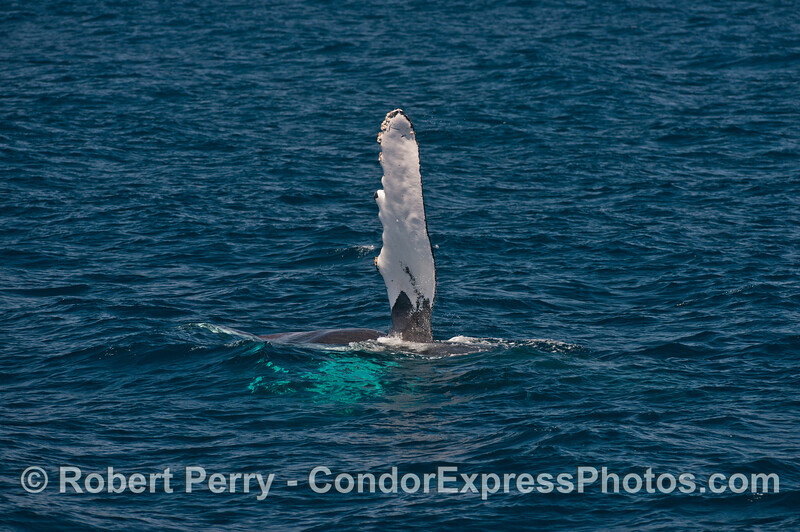 (to show mercy, I've only included a select few of the best tail throw photos below). 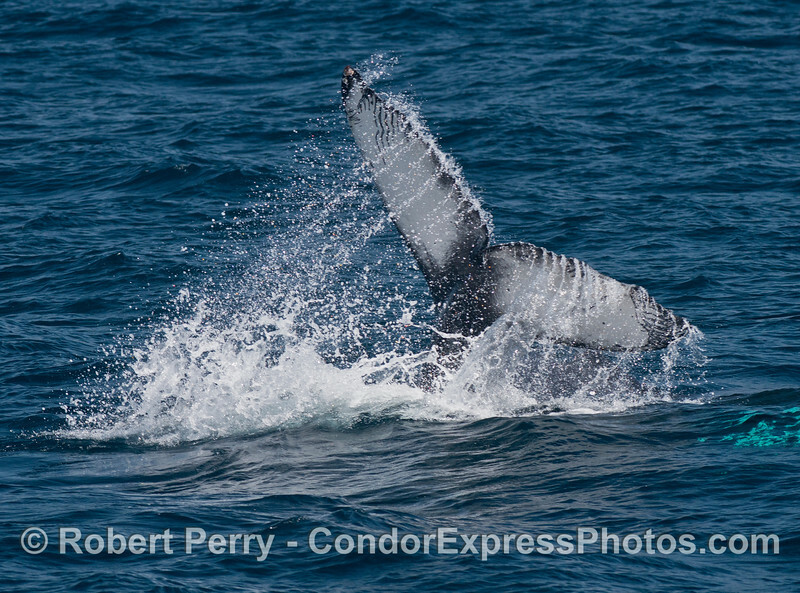 Mom slammed her big tail flukes once too, and then another where her tail fluke vibrated up and down and had you mesmerized. 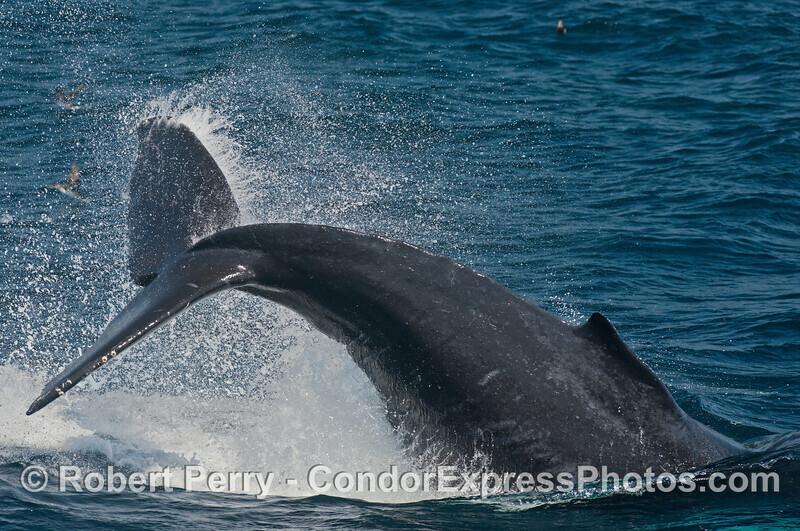 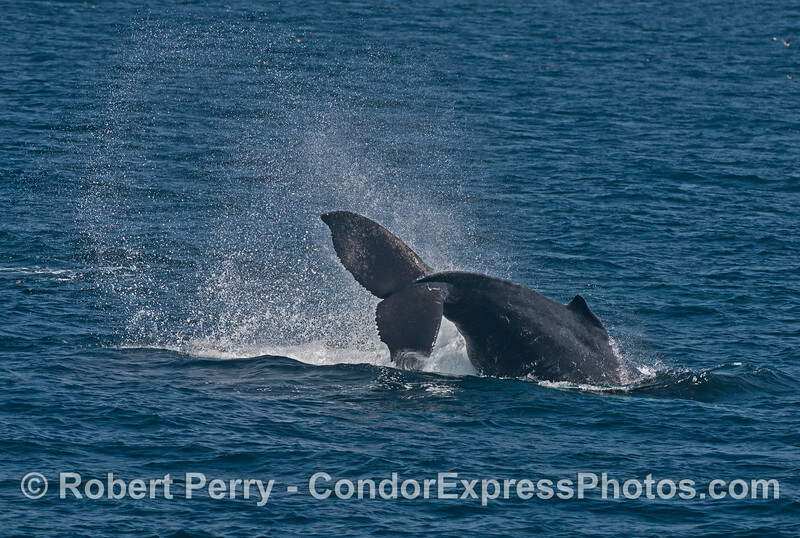 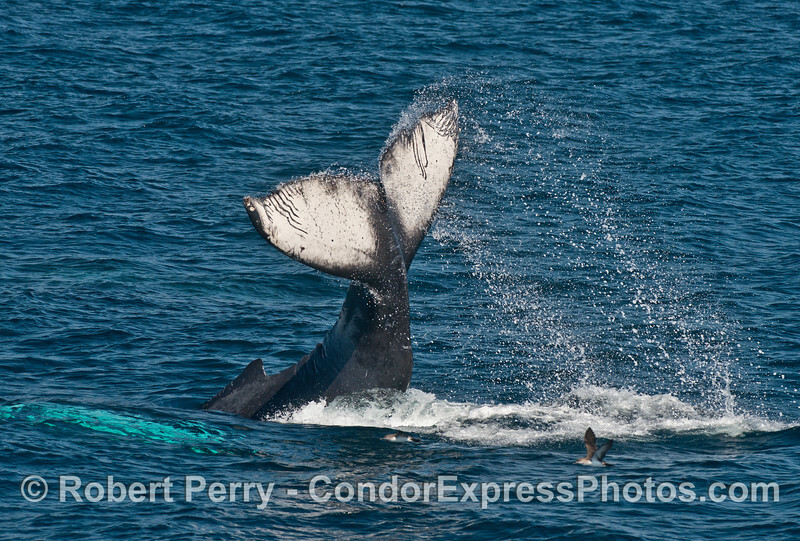 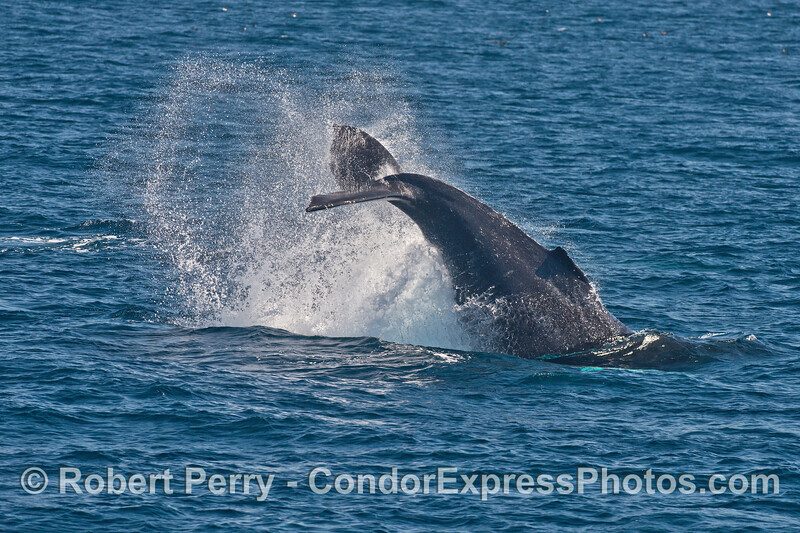 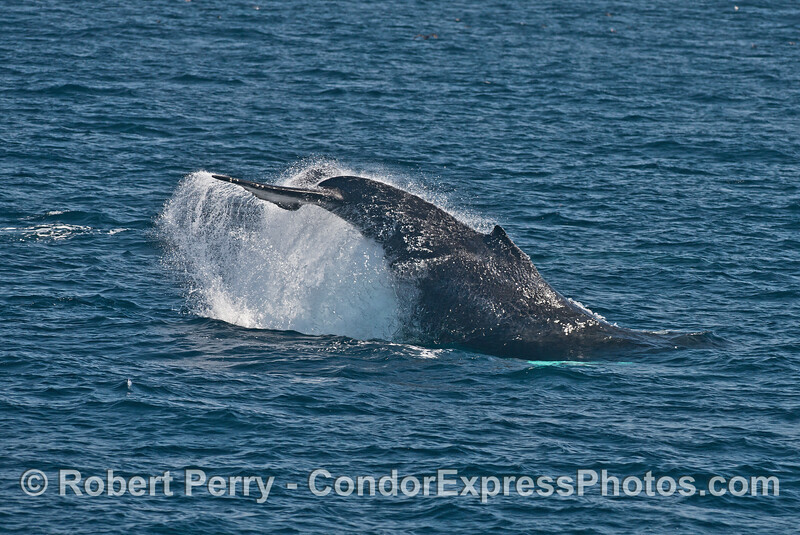 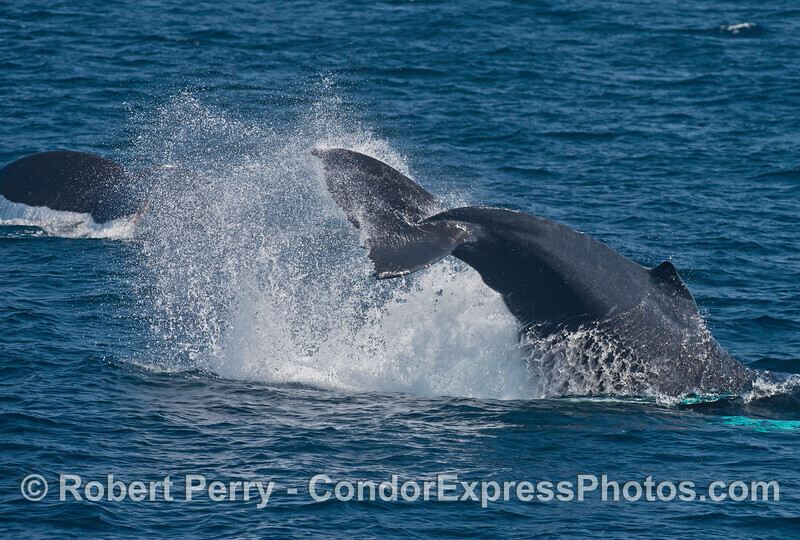 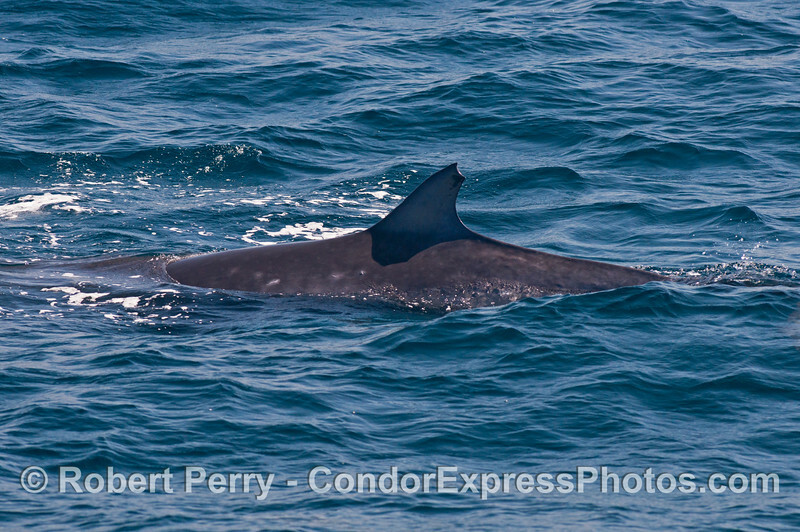 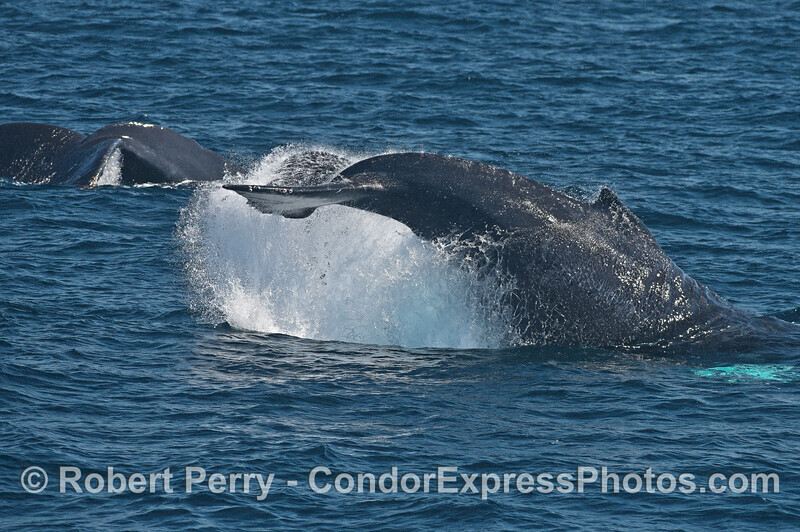 Later the calf would add rolling around and pectoral fin slapping to its performance, and at one point, later in the day. 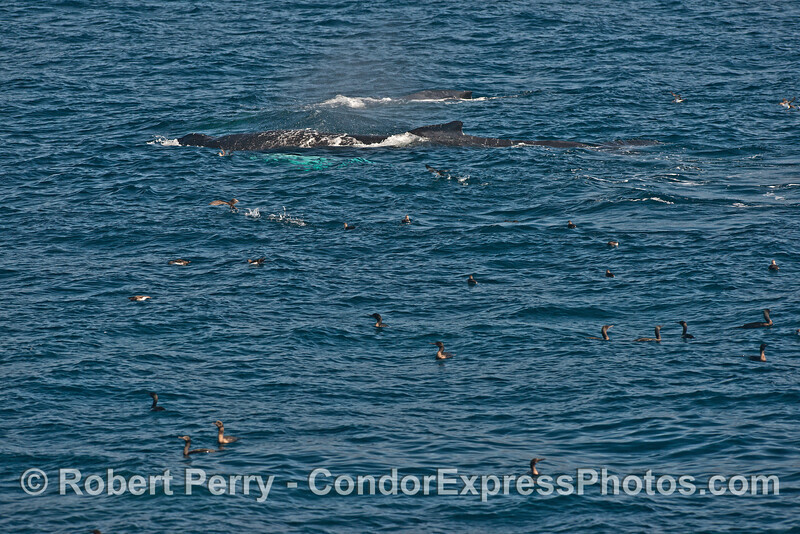 Speaking of northern anchovies and food for all the predators (black vented shearwaters, elegant terns, sea lions, Brandt’s cormorants, Heermann’s gulls, western gulls, Minke whales and long-beaked common dolphins) there were several large schools evident on the surface today as they leaped in unison to escape whatever it was attacking them from below. 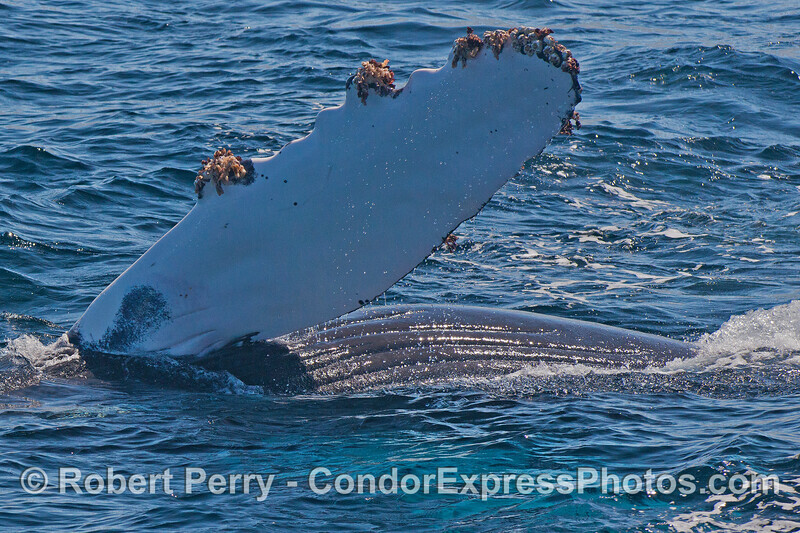 This is a good sign that our Fall season is shaping up to be a good one with abundant bait on the surface to entice all sorts of feeding behavior from the humpback throngs. 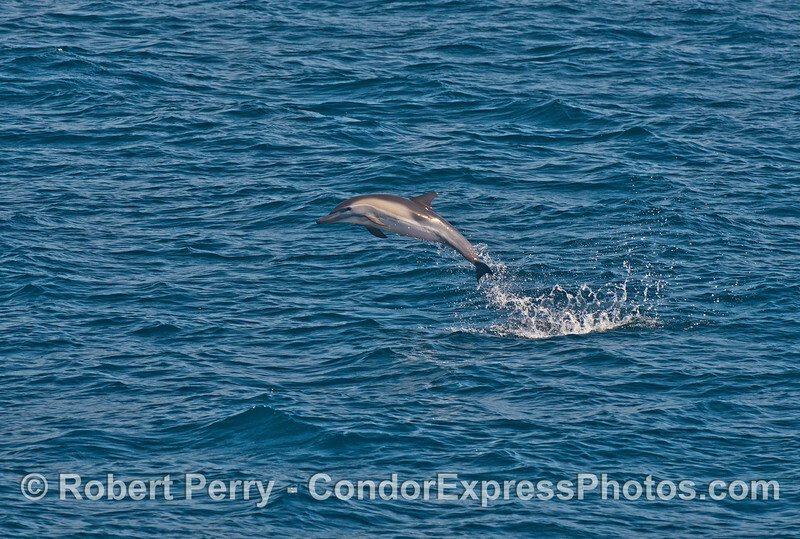 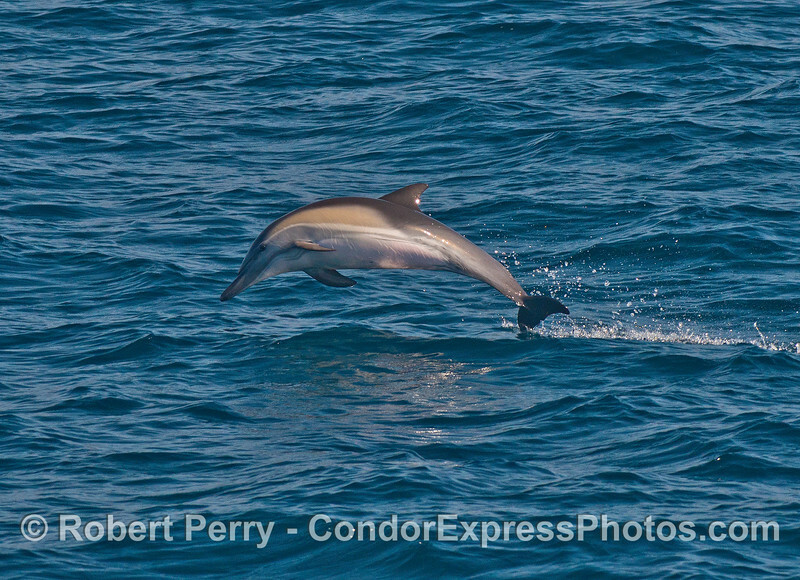 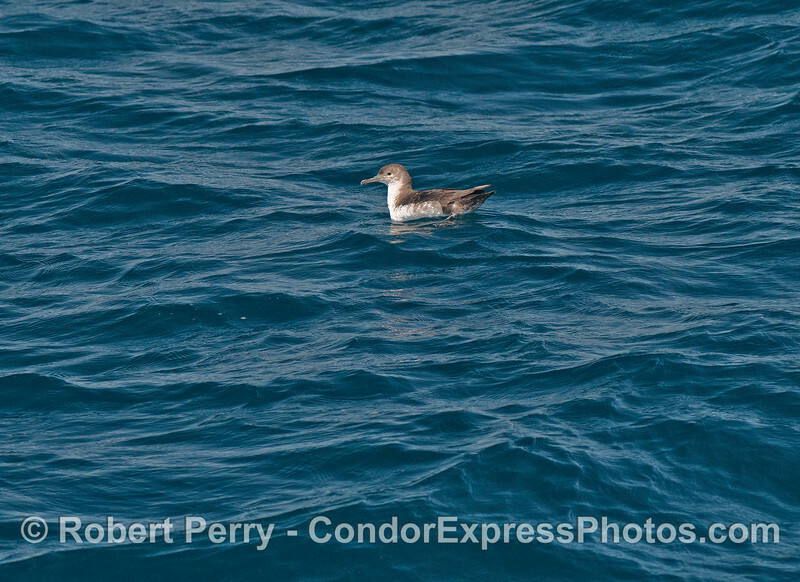 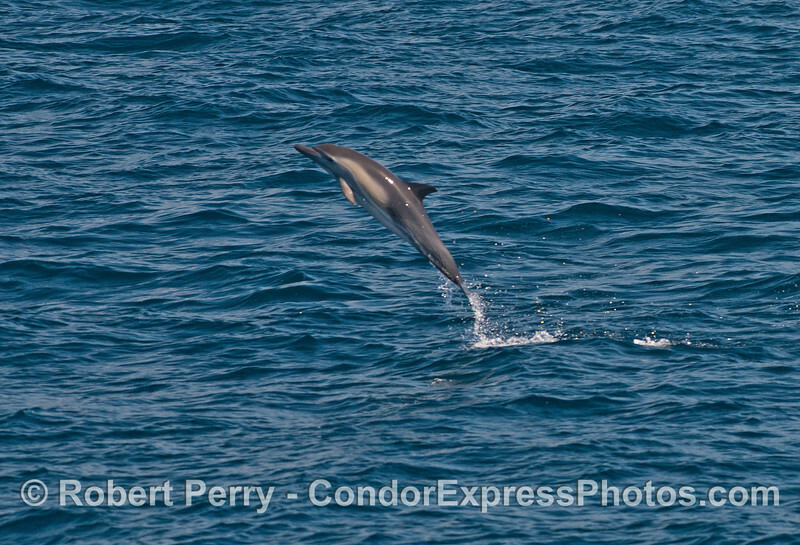 A leaping long beaked common dolphin. 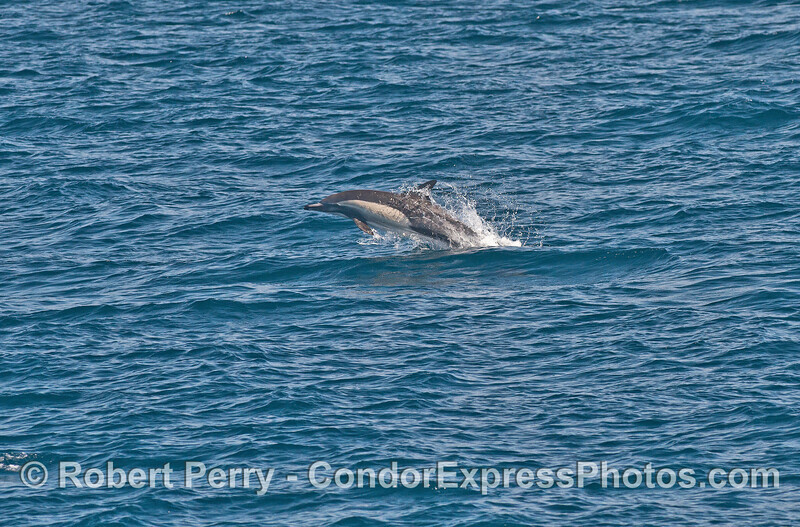 Leaping long beaked common dolphin.